A key pillar of Sikhism asks followers to ‘share the fruits of one’s labour with others before considering oneself’ – inspires a selflessness and sense of community that goes beyond faith and ethnicity. 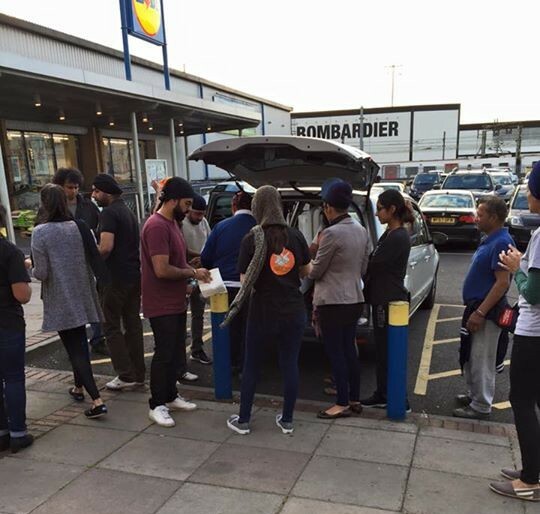 Jagdeep Singh Sohal, 31, from Ilford, along with 15 volunteers, joined together with the Midland Langar Seva Society to feed 30 homeless individuals in Ilford, London. Nor does the support stop there as volunteers tidy up any leftover mess. The idea was born from a discussion Sohal and other worshippers at Singh Sabha London East, High Road in Seven Kings, had about “giving back” to the community while using the gurdwara’s gym facilities. In time, the group hopes to extend its service to other London boroughs, as others express interest in supporting the project, including local businesses keen to donate food to expand their operation. Sohal told the Ilford Recorder: “This is just one way of helping out. It’s our duty to help people whether they’re Christian, Sikh or Muslim, it’s for everyone and we’re just tying to make a difference”. The group distribute every Tuesday at 8pm. To get involved call 077 9162 9666.